I first learned about “O” through Mytoos.com a couple of years ago. He became very near and dear to me, even though I have not met him personally. He now resides at Best Friends Parrot Garden and is an excellent Ambassador for them. Many people have asked us why O has no feathers on his head. O used to be a fully feathered DuCorps Cockatoo. The short answer is captivity. The long answer involves the loss of his first human, grief, frustration and boredom. 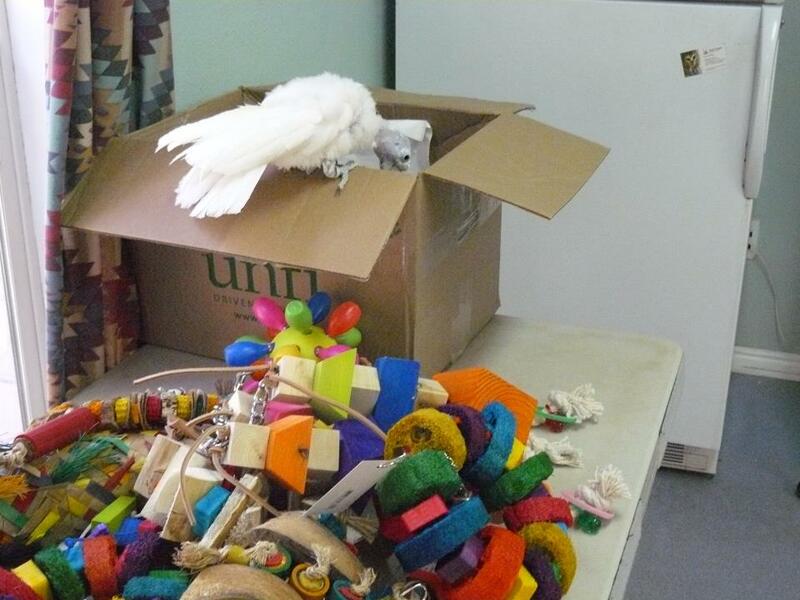 When his first owner died, he began pulling out his feathers with his feet, a habit that continues today. A feather might grow in, but he removes it as quickly as it grows. O is just one of the multitude of birds which suffer from either feather destructive behavior (FDB) or self-mutilation. We don’t know why some birds react to captivity by developing these issues, while others don’t. It doesn’t seem to matter how well a bird is cared for, fed, or interacted with. 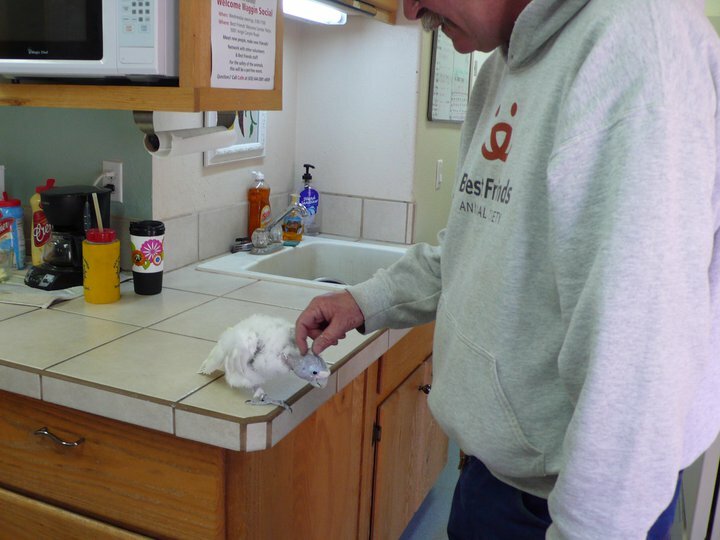 We do know that FDB does not occur in healthy wild birds. And although we love O and laugh at his antics, the sad fact is that this wonderful bird would probably be fully feathered if he had been hatched into the wild. King O was originally known as Ophelia, until a DNA test proved that she was a he. O is a very precious little soul, he has become very near and dear to thousands around the world. While his singing and dancing touches all of our hearts, His story should be remembered as a little bird who should have never been born into captivity. He should be a strong reminder to us all, how captivity affects some of Gods most precious creatures. King O’s (previously known as Ophelia) first person was someone he loved dearly. They were very close, and he lived virtually cage free as her constant companion. However, she was elderly and eventually passed away. 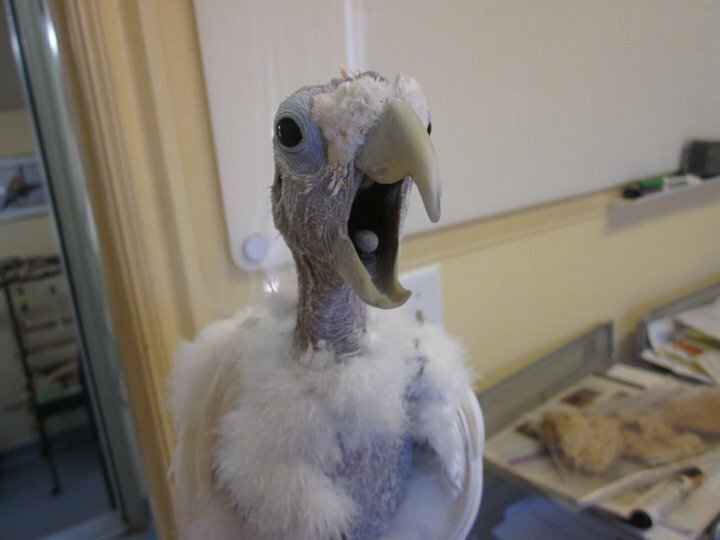 While at the funeral, her nephew saw O (then fully feathered) and decided he was “neat looking” and took him home. He had NO bird experience and apparently did NO research. O hates cages and makes his displeasure at being in one known, loudly, for hours. So first they would spray him with a water bottle, trying to get him to shut-up (hence his hysteria when you try to shower him with a spray bottle). When that didn’t work, they moved him into a back bedroom, and that’s where he lived, in the dark, with no toys and nothing to do. This is when he started plucking and pulling his feathers out with his feet. Since he was no longer “neat looking” and was starting to develop some problem behaviors (aggression) they unloaded him on a friend. The friend adored him. She treated him very similar to his first person. He went everywhere with her and was pampered and cuddled. She referred to him as her “living accessory”. The problem is, she handled him very innappropriately (full body stroking, under the wings, down the back) which just made some of his aggression issues with other people worse. In the end, she lost her house and O went to live with a co-worker and her husband, an attorney. Greg (the husband) already had a medium sulfer crested, so the family was well-versed in appropriate bird care. 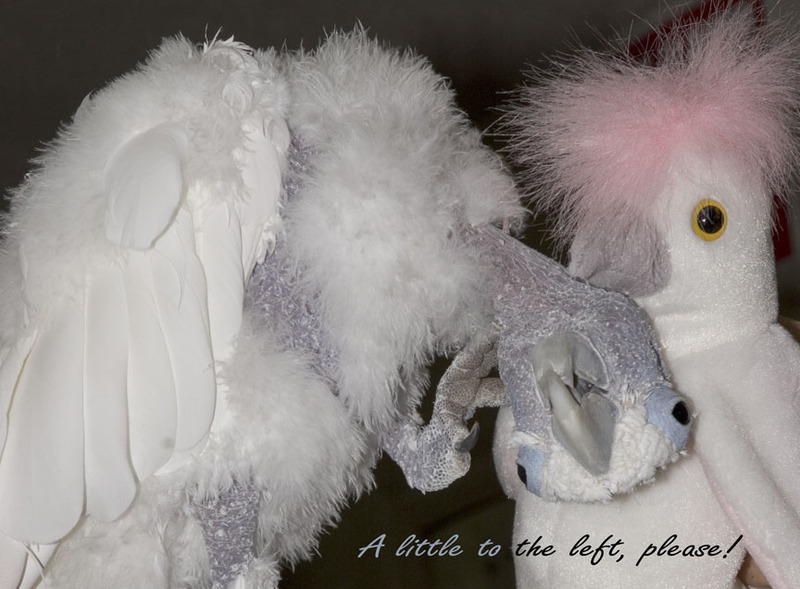 Greg was a member of MyToos, an on-line forum for cockatoo owners. He diligently tried to do his best for his bird and for O.
Greg tried to work with O. He got information from many people on the site. Bev P tried to teach how to use ABA to modify O’s behavior. But O was having none of it. Since Greg and his wife both worked, and O is amazing destructive when left to his own devises…he had to live in a cage, which he HATES. Every time they tried to interact iwth him, he would go into full on attack mode. Greg sent me videos. O was down-right scary in his anger. So, after really truly trying to do what was right for O, Greg finally admitted that this was not the right set-up for O and we decided to bring him into the sanctuary. We did a dna test on “Ophelia” and determined she was a he, and the name just didn’t sit well anymore. But even in iso, his personality and belief that he is King of Universe was very apparent, and he was renamed King O. When we brought him up from quarantine we decided to try and meet his need to live cage free…at least during the day. Our flight buildings were not an option, because at some point he broke a wing, and it was never dealt with medically. So, he started out in my office and would only go in his cage at night. He destroyed everything I had, including my phone, computer and files. So we moved him into the staff office….where he destroyed everything including computers, files, bulletin boards, wipe boards and chairs. It was getting very frustrating trying to meet his needs, but not go broke replacing things. Finally we built him a mini-flght of his own, in the main building, between the upstairs offices and the downstairs bird room. It was originally a storage closet, but we tore down the walls, wired it in, and moved his cage in. We replaced the solid door with a window door. Now he can see everything that is going on, anywhere in the building. He can even see out into the parking lot. The only time he ever has to go in his cage is at night and he’s good with that. We have seen a marked decrease in aggressive behavior. He is a happy, happy bird whose needs are finally being met. He is quite the little celebrity and just a wonderful precious soul! He is loved by so many ! king o is awesome! he is so cute dancing to the christmas music! My umbrella cockatoo, Austin, and I watch King O’s videos every time they are posted. I don’t know who loves him more–me or she! 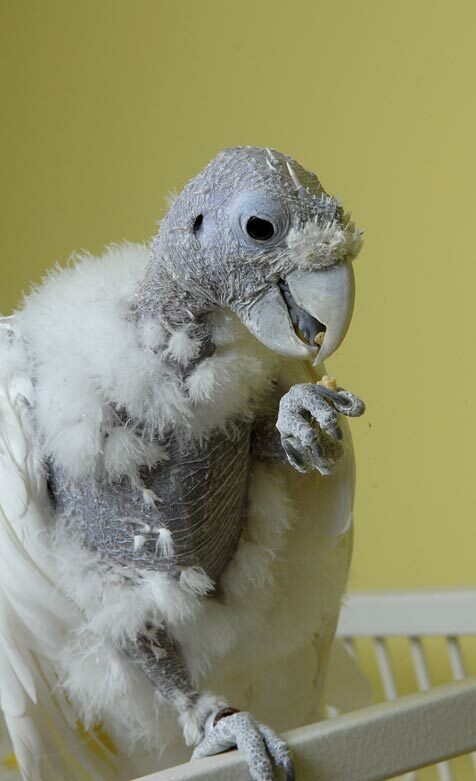 King O is such a cute sole, he is so fortunate to have been taken in by Best Friends Parrot Garden! I look forward to King “O” updates, he’s just too cute and makes me smile with his antics. Been a big fan of King O – especially after meeting and playing with him. What an imp. He has a best buddy which is good (an M2). 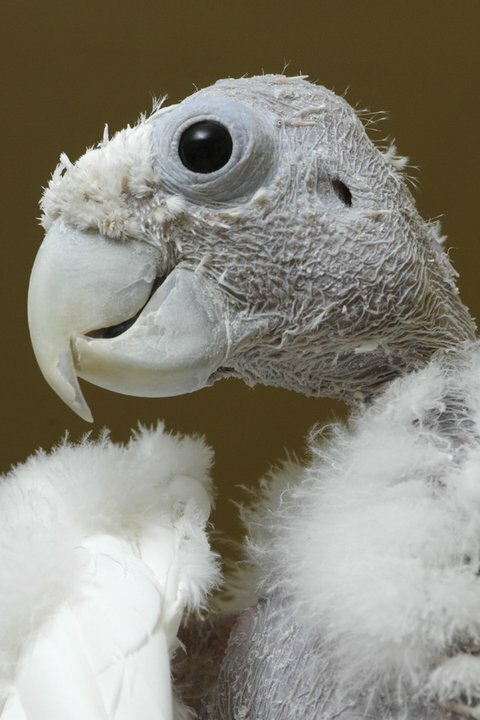 “O” is THE cutest, sexiest, most handsome, most charming, and, I suspect, one of the silliest-acting parrots on the entire web. I just adore his face; his expressions; his seeming sense of adventure; his musicality; his charmingly earnest personae; his pretty skin which I bet smells delicately sweet like honey; his beautiful muscle tone; the various feathers annointing his body like petals decorating a flower; his strong-looking footsies; his expressive little tongue; his meltingly intense eyes; his adorable little “ear holes”; and, though I suspect they’re not always very comfortable to him, I also love the amazing pinnies poking through his skin here-and-there. Someone named LORENZO AMAZONIAN KRAUSE commented (see above comment) on April 30, 2014, a brief expression/a loving sentiment to “O” which I hope is merely a loving sentiment BUT which concerns me because its tone seems to suggest or imply that beautiful “O” may have crossed that Rainbow Bridge, so to speak. Have I misinterpreted it (and I hope I have…)? I’m surprised you got him to accept night-time caging! Thank you all for treating him like the King that he is 😉 He looks ready to burst with joy in the Jingle Bells video clip. Lol. What a beautiful character. Thank Gd for good people like you guys.